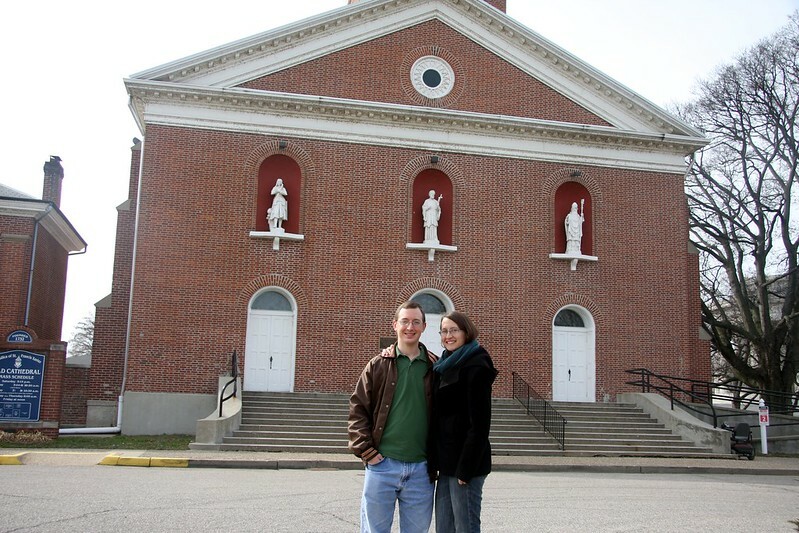 After a very stressful start to the year (many things due for my doctoral program), my boyfriend and I celebrated on February 18, 2012 with a day trip to Vincennes, Indiana to see the Basilica of St. Francis Xavier, also known as the Old Cathedral. This is the first basilica we’ve visited that has a rather anemic Wikipedia page (gasp! ), and – in general – not much of an online presence. The parish community was founded in 1749 around a settlement of French Canadian fur traders and local Indians. The church underwent two previous buildings prior to its current incarnation in 1826. 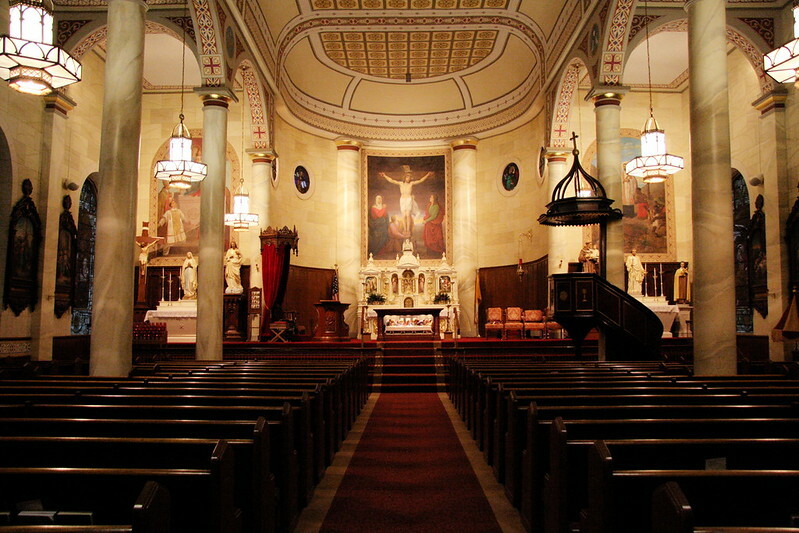 When the new Diocese of Vincennes was created in 1834, St. Francis Xavier Catholic Church became the diocese’s new cathedral. 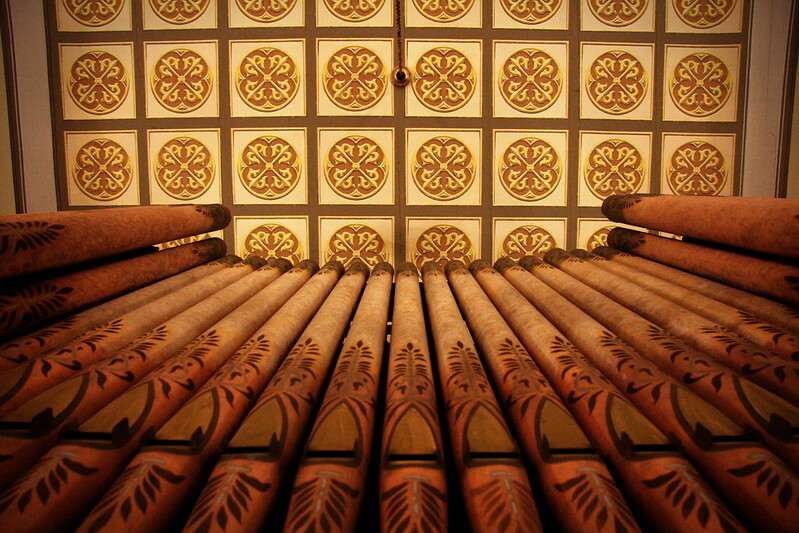 In 1970, the church was raised to the status of basilica due to its important history in Vincennes and the surrounding areas. 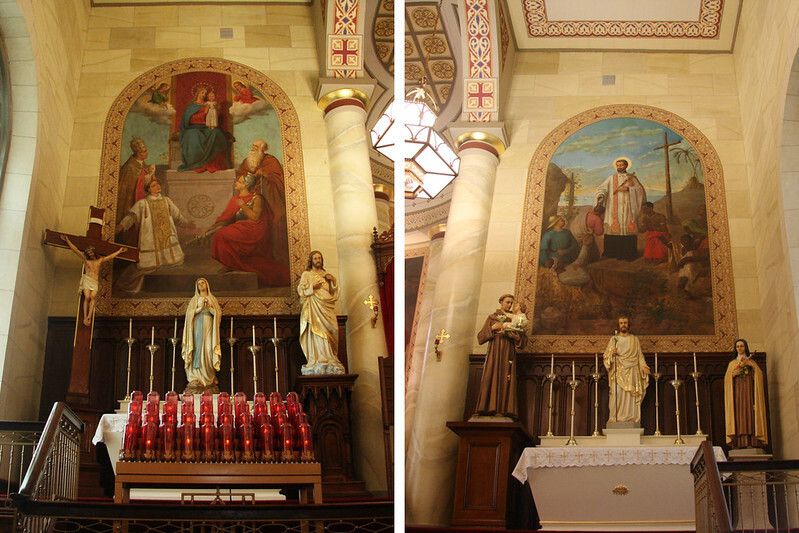 To the left of the altar is a painting of the patron saints of the first four bishops of Vincennes (Saints Simon, Celestine, Stephen, and Maurice) adoring the Madonna and child. To the right is St. Francis Xavier during his ministry. Along the walls are gorgeous stained glass windows from Columbus, Ohio that were installed in 1908. 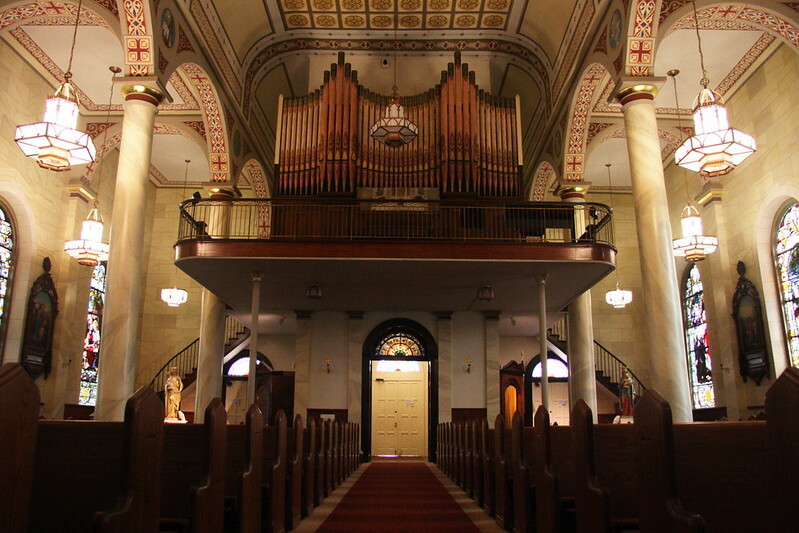 On either side of the front of the church is a staircase leading down to the crypt area. Encased in the base of the altar there are the remains of a third century martyr, a 12 year-old Roman boy canonized as St. Aufidia. 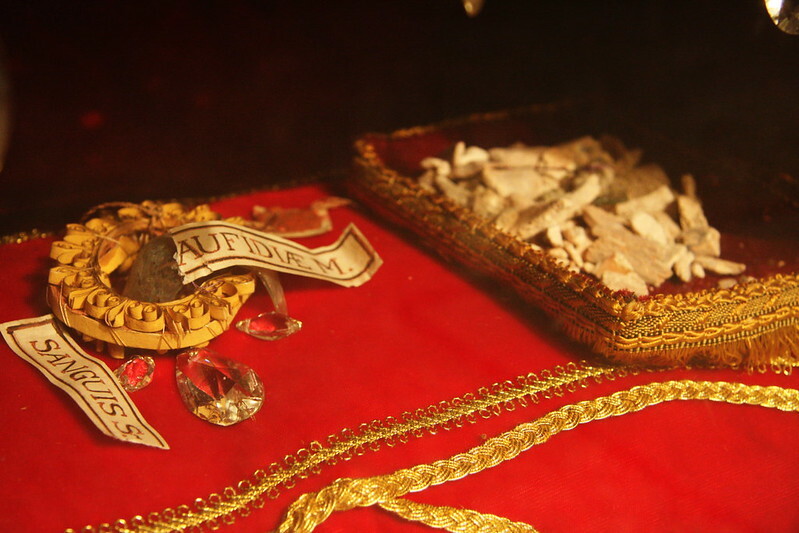 St. Aufidia’s remains were brought here by the first bishop of the new diocese, the Most Reverend Simon William Gabriel Bruté de Rémur, whose remains are included in the crypt. In fact, the first four bishops of the diocese—Simon Bruté (1834-1839), Celestine de la Hailandière (1839-1847), John Stephen Bazin (1847-1848), and Maurice de St. Palais—are all buried here in the crypt. 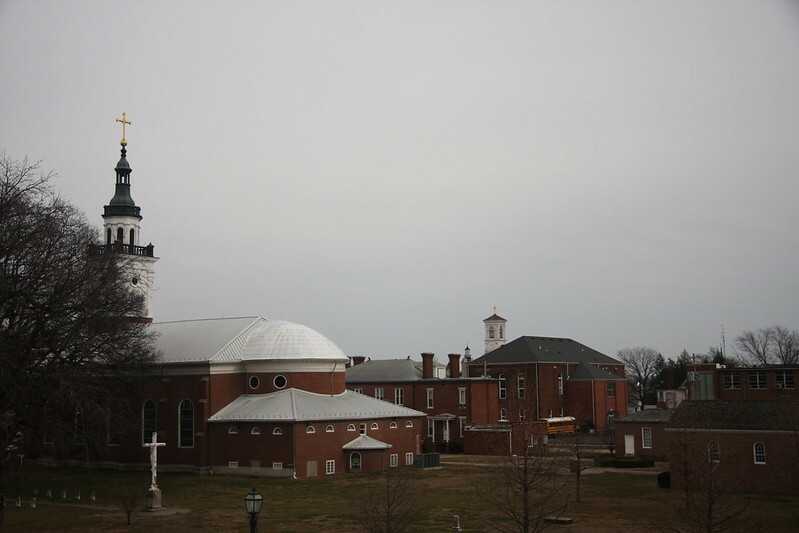 Over the years, the parish community here has belonged to six different sovereign groups: the Indians, French, Spanish, British, Vincennes (when conquered by George Rogers Clark), and the United States. 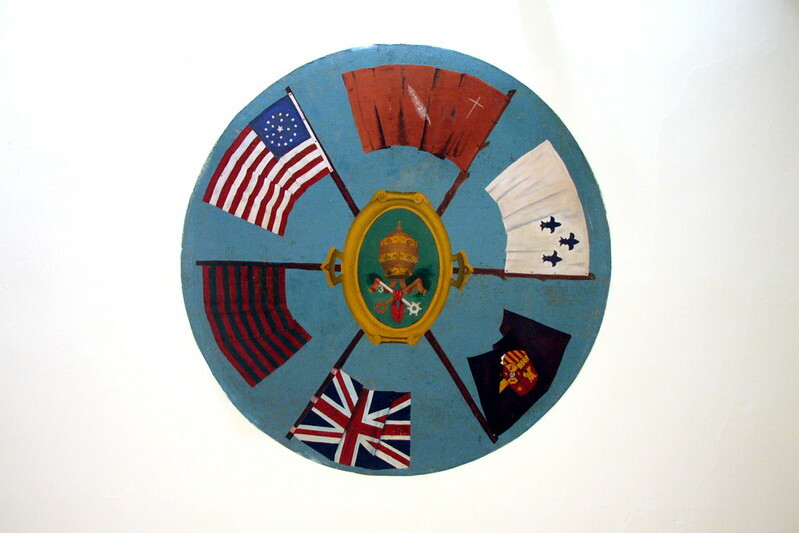 The below painting—which can be seen on the ceiling of the crypt—commemorates the different groups the church has served under. 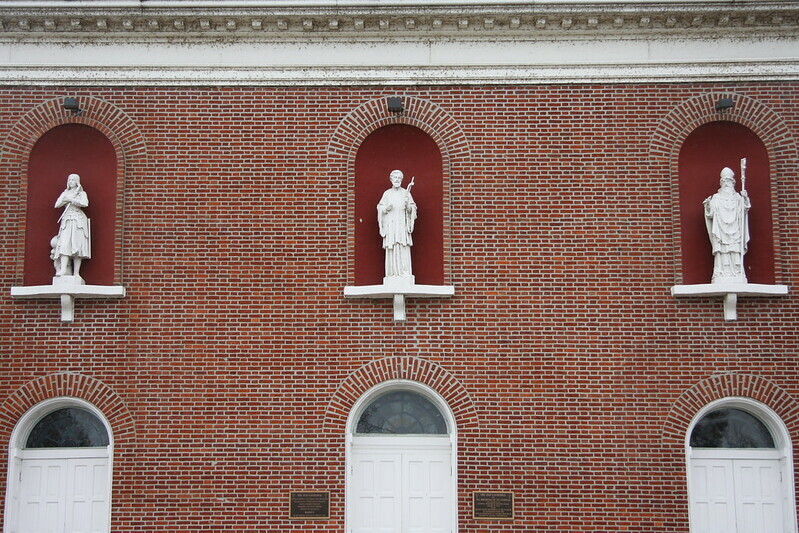 The front of the church holds three statues above the doorways. 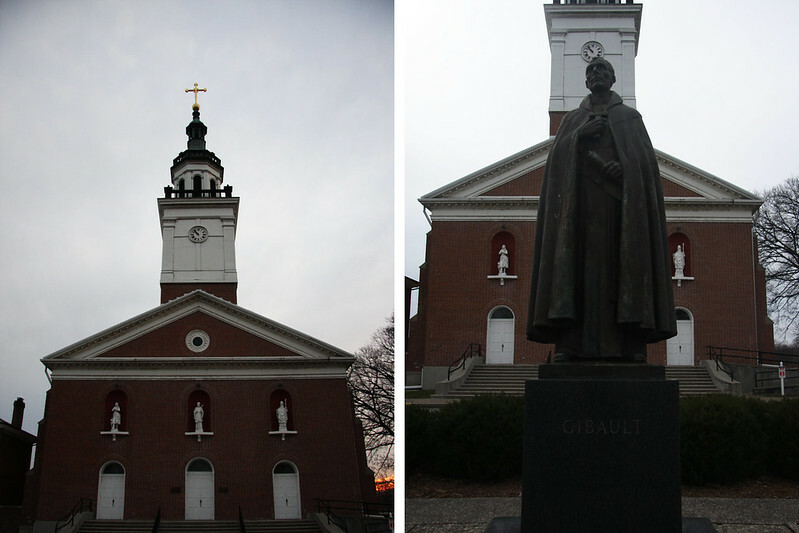 From left to right are St. Joan of Arc, St. Francis Xavier, and St. Patrick. 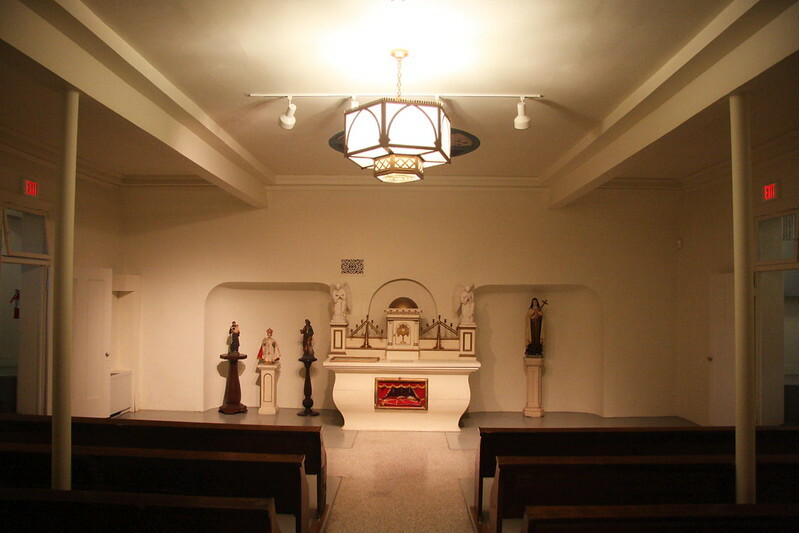 Also on the basilica’s grounds are the rectory, an old building from the now-defunct St. Gabriel’s College, a cemetery, and the old Catholic grade school. The library for which the basilica is well known is next door to the church, and was started by Bishop Bruté’s personal collection of over 5,000 books. 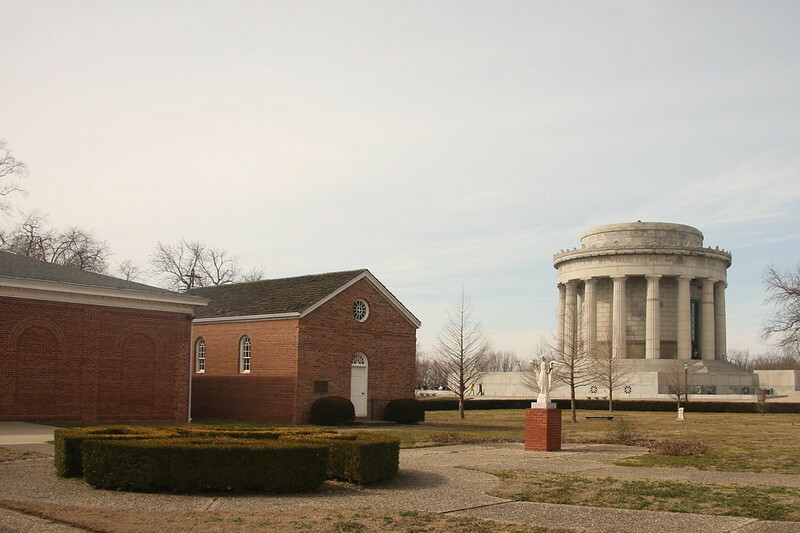 Just next door to the basilica, along the Wabash River, is the George Rogers Clark Memorial, a United States National Park. Finally, on a side note, we stopped at this wonderful little burger store on our way here. If you’re going to be nearby Moonshine, IL for breakfast or lunch, you have to stop by this town of population 2 to grab one of their renowned burgers! You can see a CBS Sunday Morning Show segment here, or the store’s webpage here, for more information. 😀 Thanks! I’ve been quite busy, hence this post going up over a year after we visited it. 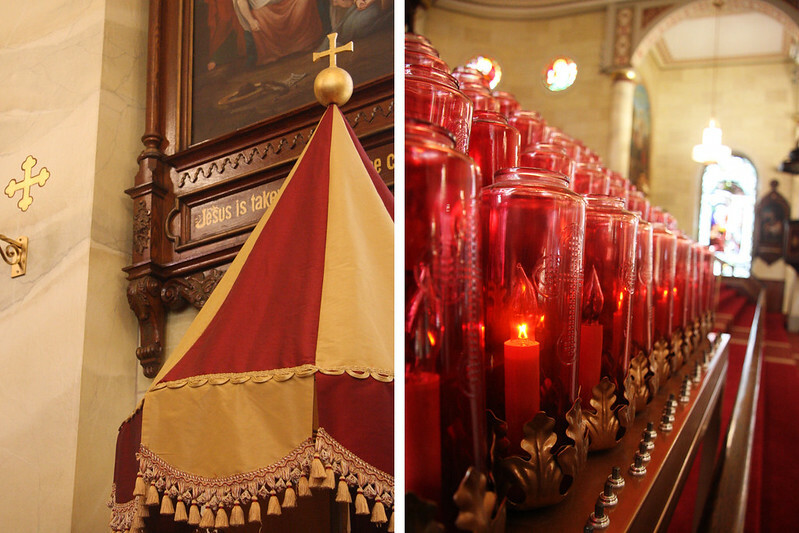 But I’m really behind now – 15 more basilicas, and several other churches from the US, as well as a few overseas. I’ll have to start catching up! Allie, so nice to see you on your trek to find the great basilicas. I look forward to these posts. Thanks, Dennis. Keeping up with your blog has been a welcome relief during a busy stretch here at school. I visited this Basilica almost 10 years ago while visiting the nearby National Park. It was great to read this post to bring back the memories, and to point out some details that I had not realized before. Glad you are back travelling again! They used to say St. Aufidia was a girl. Now a martyred boy? Thanks for great photos and text from my town.